Our pastries and cookies are all homemade and baked at the store. Our main focus is quality and taste. Thats why we use only pure butter. 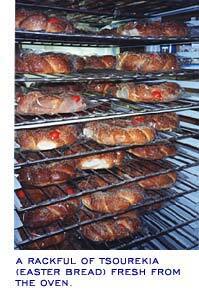 We also bake Tsourekia (Greek Easter Sweet Bread) every Saturday and during the holidays we bake them everyday. At Easter we make them with red eggs. And for New Years we make Vasilopites, with coins for good luck in the New Year.